Windows stalwart Cakewalk has in fact gone cross-platform (Windows VSTi/DirectX and Mac AU/VSTi). So, why’d they do it? Apparently, they wanted to unleash this serious synth monster on two platforms: think two DVDs, 1500+ sound programs, major layering and easy editing and morphing. More details from Cakewalk after the jump, and I’ll have more after I get to meet with Cakewalk themselves. 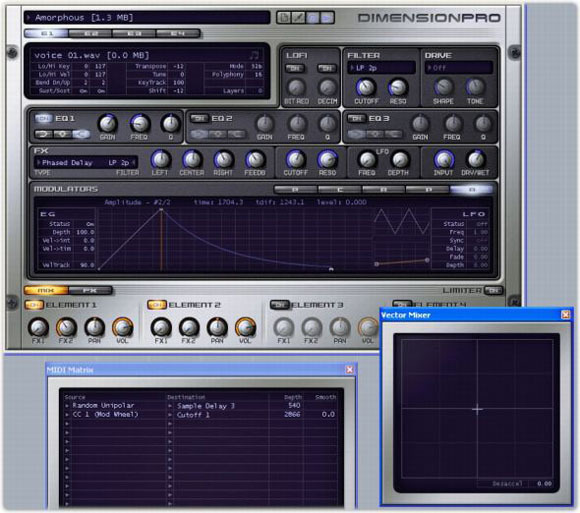 Dimension Pro is the synth from Cakewalk’s Project5 synth, only now made “Pro” by the addition of two DVDs of content. It’s a multi-engine sampling instrument, with virtual analog and physical modeling synthesis built in. And, really, quite a lot more. I’ll check it out at AES, but you can check it out at Cakewalk. I want to get to play with this thing before I make any final judgment — but this is definitely high on my list of synths to play with! CDM 5 Words: Serious synth cross-platform surprise.